Madiha Afzal lays out Pakistanis’ own views on terrorist groups, on jihad, on religious minorities and non-Muslims, on America, and on their place in the world. The views are not radical at first glance, but are riddled with conspiracy theories. Afzal explains how the two pillars that define the Pakistani state―Islam and a paranoia about India―have led to a regressive form of Islamization in Pakistan’s narratives, laws, and curricula. These, in turn, have shaped its citizens’ attitudes. In the end, Afzal suggests how this beleaguered nation―one with seemingly insurmountable problems in governance and education―can change course. Madiha Afzal is a nonresident fellow at Brookings Institution. She is also an adjunct assistant professor of global policy at Johns Hopkins SAIS and was previously an assistant professor of public policy at the University of Maryland. She writes regularly for Pakistani and international publications and has been a consultant for the World Bank and DFID. For her writing on education in Pakistan, she was named to Lo Spazio della Politica’s list of Top 100 Global Thinkers of 2013. 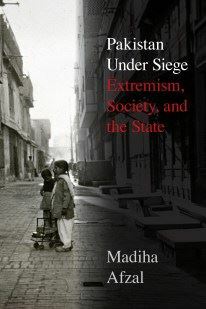 Her research lies at the intersection of development, security, and political economy, with a focus on Pakistan.